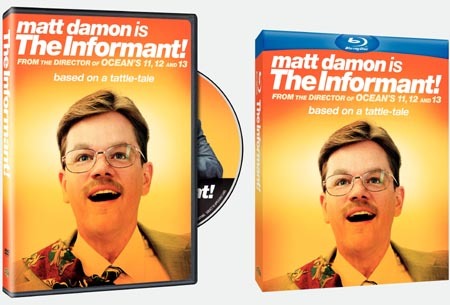 Another subject we inadvertently dropped a little while back is THE INFORMANT! After its quick slide down the domestic box-office charts and relative non-performance in the international market, Warner Bros. announced after the New Year that the otherwise well-received Matt Damon drama would debut on DVD and Blu-ray Disc on Tuesday, February 23. It’s no secret the studio has been hoping Damon will nab a Best Actor nod or win from the Academy of Motion Picture Arts and Sciences, which announces all the Oscar nominees at 7:30 a.m. CST tomorrow, Tuesday, February 2, so they’re surely banking on prestige begetting extra INFORMANT! revenue between now and the Academy Awards ceremony on March 7. According to the key box artwork floating in cyberspace – we’ve been unable to locate a formal press release, for whatever reason – the DVD will feature THE INFORMANT! in all its widescreen glory but the only extras will be a trailer and a selection of deleted scenes. The Blu-ray will also offer a commentary track featuring director Steven Soderbergh and scriptwriter Scott Z. Burns, along with the trailer, deletions, and a 16×9 enhanced 1080p transfer. Apparently, that’s all, folks. Our cynical side smells a double-dip in the near future, but if it comes in the form of a Criterion Collection edition to stick on the shelf alongside Soderbergh’s CHE, TRAFFIC, and SCHIZOPOLIS, we’ll politely wait it out. For now, once you’re done marveling at C-U Blogfidential’s favorite orange sherbet artwork design of 2009, surf over to this “For Your Consideration” Web site set up by the WB to pitch its Oscar contenders. After your snickering at the inclusion of THE BLIND SIDE subsides, take a look at the primary INFORMANT! item unique to this page – a PDF download of the script, although this version is a transcription of the final release version of the movie and not what Soderbergh used on set. It might still be valuable for students of film to see how this particular story looks on paper in the proper format. We plan to inform you a few more times about THE INFORMANT! before moving on to less corn-fed pastures, so all you budding CUBlog agents should keep your spying eyes right here! This entry was posted on Monday, February 1st, 2010 at 12:12 am	and is filed under Gone Hollywood, Home Videos du C-U. You can follow any responses to this entry through the RSS 2.0 feed. Both comments and pings are currently closed. 14 distant relations of Jan Tschichold dissected this page in 0.359 seconds while exacting sweet revenge in silence.